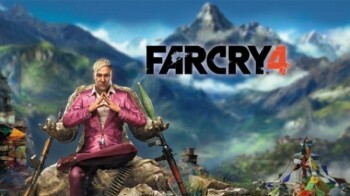 Pagan Min, the over the top antagonist of Far Cry 4, might seem vaguely familiar to you if you’ve played Far Cry 3. It’s not the excellent voice work by Troy Baker that makes you feel that, oh no. 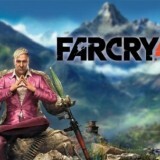 It’s that you’re looking at Ubisoft’s attempt to bottle the lightning strike that was Vass – Far Cry 3’s baddy of note. 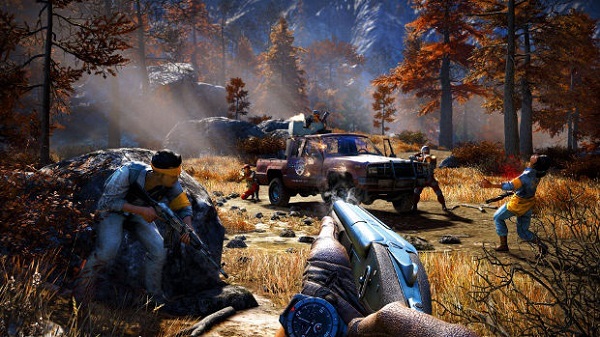 Things don’t stop there in the close comparisons between Far Cry 4 and Far Cry 3. Once again you fill the hapless shoes of a “fish out of water”. A stranger in a hostile and foreign land who is thrust in to action and bloody war in the opening few minutes of the game. These shoes belong to Ajay, a former resident of Kayrat who left when just a baby. Returning to honour his mother’s wish to have her ashes scattered in her home town Ajay walks straight in to the heart of a revolution to strike back against the tyrannical madman Pagan Min. Swapping the deep blue seas and soft sandy beaches of Far Cry 3 for the snow tipped mountains and lakes of the Himalayas, Far Cry 4 takes that winning formula and expands on it several times over. Much of the same mechanics are still in place. You can take on outposts in any random order you like, slowly taking control of areas of the map as you liberate each one. Once again this is where some of the greatest moments happen. Random animal encounters can turn your meticulously planned assault on a compound in to a breeze as said random critter sets about mauling and chewing their way through the guards. Again the levelling up of equipment is done via hunting various animals from around the area. 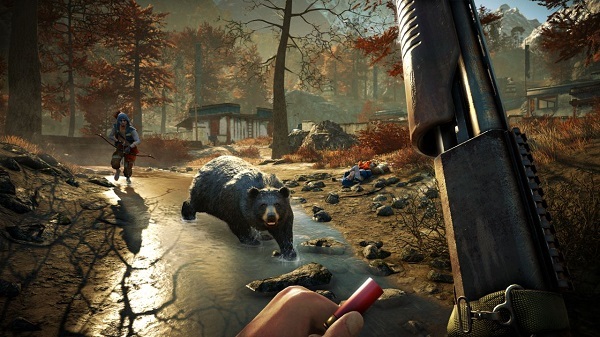 Tracking down each of the animals on your crafting list and stalking them with a bow can take up a very enjoyable chunk of your time with Far Cry 4. Story wise things move a solid pace and there are several key moments that require you to side with one rebel leader of the other. These moments are often polarizing and the leader you shunned that time around will be none too pleased. That said, despite the immediate effects these choices have, there seems to be little divergence caused by making these selections so ultimately it makes little difference. The world map for Far Cry 4 is big and pretty well stocked with side missions, random encounters, hunting and story missions. It should keep you occupied well in to the 20 + hour mark. Shooting and movement feels great, just as it did back in Far Cry 3. The direct control method for the vehicles that it employs is very frustrating at times and you can switch it back to a more traditional trigger to accelerate method if you want. The downside is that this method makes aiming and shooting whilst speeding through the jungle mighty tricky. Transport is varied once again with you being able to pick from old trucks, cars and quad bikes. A welcome addition is the little lightweight gyrocopter. This allows you to take to the skies and cover large amounts of the map with relative ease. As seems to be ubiquitous with Ubisoft games lately you once again scale towers – radio ones in this case. Each tower scaled with reveal another segment of the map, showing you points of interest in the area (side quests etc). Scaling the towers at least feels like a worthwhile activity unlike other implementation of this mechanic recently but maybe it’s about time Ubi stepped back from the tower synchronisation trope? 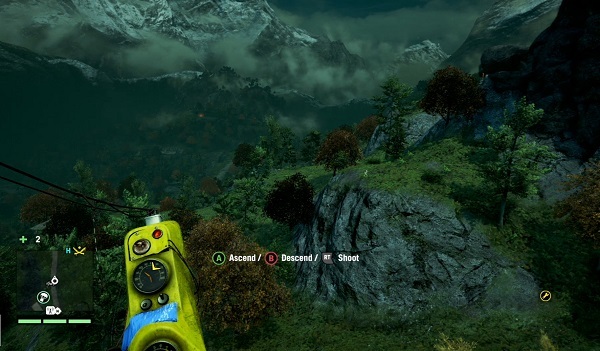 Far Cry 4 looks gorgeous. Luscious landscapes, huge mountains and hills and explosions a plenty help keep the game roaring along at a raucous and bloody pace. The odd little frame dip or tear here or there but for the most part I had little to no trouble technically running the game. Equally as polished is the musical score and voice work of the game with Troy Baker putting in a sterling performance (and one out of step to the other roles he’s been in lately) as Min. The multiplayer aspects are pretty lacklustre and will hold little interest for most unless diehard fans of the series. The Co-Op on the other hands does lend itself nicely to the scenarios it is meant for – taking fortresses/camps etc. Not entirely essential this mode is at least enjoyable and reasonably problem free. Far Cry 4 is a large slice of deja vu. Having said that when the slice is that tasty and that well produced you’re more than happy to fork it down another time. Far Cry 4 builds on the things that made Far Cry 3 such an enjoyable game and improves on them in almost every single way. Offering a blisteringly paced open world FPS that you can disappear in to for days with each moment being almost as fun as the last. Exploring the beautifully realised region of Kyrat can be a real pleasure, except when those damn eagles attack you! Graphically stunning with high production values and a great sense of humour – you’ll be hard pressed to find something more appealing over these dark winter months.